December 7, 2015 – On this Pearl Harbor Day, we mark the Japanese attack on Hawaii, and travel back 75 years to meet Aarol W. “Bud” Irish in the European Theater where he fought the Nazis. 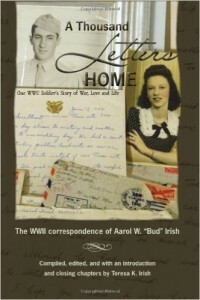 On the Memorial Day after Bud passed away in 2006, his daughter Teresa opened her father’s mysterious old Army trunk and found stacks and stacks of letters from the front. Through these, she met her father as a young man, and shared him with us in: A Thousand Letters Home . Along with over 100 pictures, the book also includes the responses from Bud’s girl back home — who would eventually become his wife and Teresa’s mother. The book has proved such an inspiration to readers, that Teresa now spends her time doing public speaking on the letters, helping new generations of veterans and their families connect with the trauma that follows when the guns fall silent. You can learn more at AThousandLettersHome.com and by following Teresa @ThousandLetters on Twitter.